Samsung launched its Galaxy Tab in the U.S. this week, and four major wireless carriers will eventually carry the device. The 7-inch tablet sports a 1GHz Cortex A8 ARM processor, a 1,024x600-pixel resolution touchscreen and rear- and forward-facing cameras. The device comes with 16GB of storage, expandable to 32GB. The base model of the Tab sells for $600, customers who sign a two-year contract can get the device for $400. Walt Mossberg of The Wall Street Journal called the Galaxy Tab the iPad's "first real rival," despite it having some minor usability issues. During tests of the tablet's video calling service, Mossberg experienced problems with the Qik video software, noting that some calls failed to go through, dropped, or dropped audio. According to Mossberg, Qik is "fixing the problems." Though the Tab is touted partly for its compatibility with Adobe Flash, Mossberg wrote that it "needs work," as it slowed the browser down. "Sometimes they [embedded Flash videos] played and sometimes they didn't," said Mossberg, noting that Flash caused the Tab to crash at one point. Mossberg also took issue with the lack of tablet specific apps on the Android Market app store. Some of the apps written for phones scaled to tablet size, but others "were surrounded by large black bars." Using the same battery test as when he reviewed the iPad, Mossberg got 6 hours and 50 minutes of battery life out of the Tab, compared to 11 hours and 28 minutes from the iPad. In his review for The New York Times, David Pogue called the new tablet "gorgeous and expensive." Pogue found that the device's diminutive size wasn't a significant issue, preferring to think of it as "like an extra-spacious Android phone" rather than a "cramped iPad." According to Pogue, the smaller size has a "huge" payoff, with the Tab weighing 13 ounces compared to the iPad's 1.5 pounds. Pogue enjoyed the portability of the device, noting that users can carry it in a blazer or jeans pocket. However, Pogue's experience with the device wasn't completely positive. Like Mossberg, Pogue had trouble getting Flash videos to play, especially on the ESPN website. "As smooth and slick and convenient as the Galaxy is, though, its not without its frustrations," wrote Pogue, who found the Android ecosystem "unlimited, chaotic, and more confusing." "The biggest drawback of the Galaxy may be its price: $600," said Pogue. The review also lamented the Galaxy Tab's inability to charge from a laptop USB port. "So yes, the dawn of the would-be iPad is upon us. But the Android tablet concept represents more than just a lame effort to grab a slice of tablet hype. As with Android phones, it represents an alternative thats different enough to justify its existence," Pogue concluded. Wired reviewer Christopher Null wrote that, as with its smartphones, Samsung "continues to take its cues from Apple," adding that it's "not necessarily a bad thing." Null appreciated the better portability afforded by the Galaxy Tab's smaller size, remarking that the Tab "feels like a jumbo-sized cellphone." However, Null found that the tablet was "prone to dropping" because of its smaller form factor and slick surface. "In use, the Galaxy Tab performs well, but is not exemplary," wrote Null. "It feels snappy enough, but longish load times can sometimes be tiresome, and webpages invariably loaded more slowly than the iPad  sometimes taking twice as long. We also ran into a few issues with apps hanging and the Wi-Fi connection suddenly vanishing without explanation. Reboots solved both issues." Null had only a few "relatively minor complaints" about the Galaxy Tab, deciding in the end that the device might not compete directly with the iPad. "The Tab ultimately reveals itself not as a competitor to the iPad but as a new class of mobile devices: a minitablet that is designed to go everywhere you do." 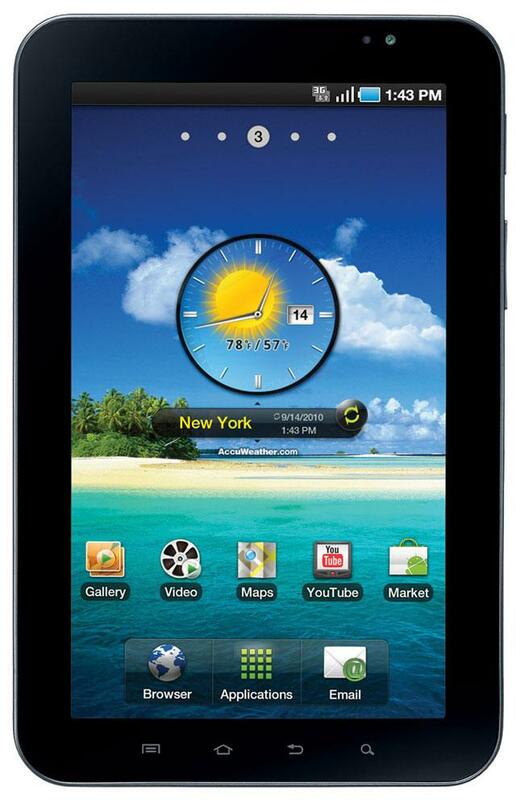 The Galaxy Tab is largely considered the first "real" competitor to the iPad, which launched in April. As such, sales of the Tab will likely stand as a touchstone for the "raft of new devices" scheduled to be released on the heels of the Tab. Competitors will have significant ground to make up. In the September quarter, the iPad dominated the tablet market with a 95 percent market share. Research in Motion is set to launch its own 7-inch tablet in early 2011. RIM co-Chief Executive Jim Balsillie told Bloomberg this week that the PlayBook will go on sale for "under" $500. The BlackBerry maker unveiled the tablet, which is aimed at business users, in September. In October, Apple Chief Executive Steve Jobs disparaged the 7-inch form factor, calling it "too small to express the software." Jobs joked that the smaller tablets would need to ship with sandpaper so users can file down their fingers in order to hit smaller targets on the screen.